According to the report, "this incident remains under investigation," although it probably doesn't. 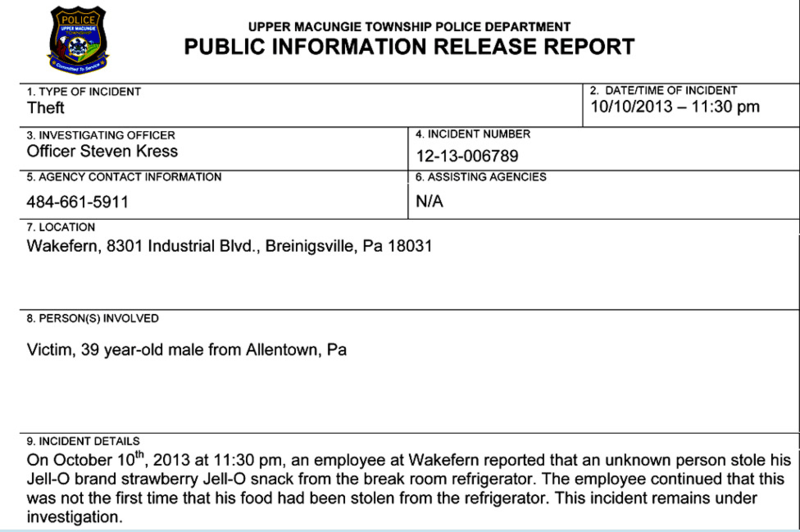 Still, office snack theft is, after all, a crime. 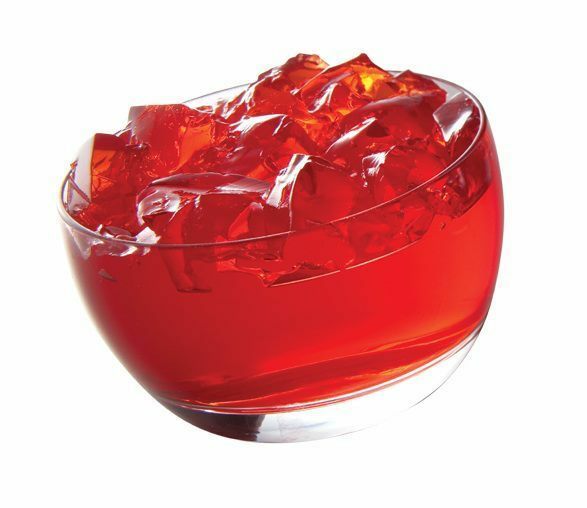 Under Pennsylvania law, for example, this incident would be classified as "theft by unlawful taking or disposition" of "movable property," assuming the Jell-O was taken "with intent to deprive [the victim] thereof," which it almost certainly was. 18 Pa. Cons. Stat. § 3921(a). Theft of an item valued at less than $50 (according to the market value at the time and place of the crime) is a third-degree misdemeanor (§ 3903(b)(2)), unless it is committed during a manmade, natural or "war-caused" disaster (§3903(a)(1)). Since "war-caused disaster" is defined as "any condition following an attack upon the United States" including but not limited to "overt paramilitary actions" or "sabotage," and there is no expiration date for such a "condition," the same offense would appear to be a second-degree felony. The thief is probably lucky that we finally stood down from Threat Level Orange, or else this Jello-O sabotage might win him a free trip to Gitmo. 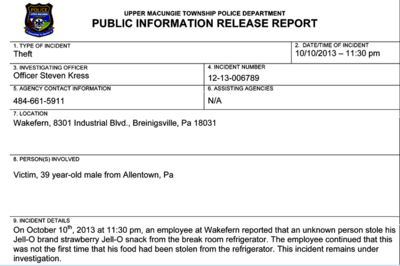 The incident occured at a Wakefern Food Corporation warehouse in Pennsylvania. Wakefern is said to be the largest retailer-owned supermarket co-op in the United States, incorporating mainly ShopRite and PriceRite stores in the eastern part of the country. Its headquarters are in New Jersey. Perhaps ironically, Wakefern was named as one of the "Best Places to Work in New Jersey" by JBIZ Magazine, which presumably means either that the HQ is free of the "Lord of the Flies" ethos that seems to prevail in Pennsylvania, or that there is a massive coverup going on. The company's website contains not a word about the incident (despite the national-security implications), although it does claim to foster "an environment in which all associates are valued, respected, and encouraged to reach their full potential" and to exemplify the company's "core values of integrity, innovation and teamwork." Of course, it's easy to say you are committed to integrity and teamwork, but deeds speak louder than words. I would anticipate a press release or at least a statement by Wakefern's CEO about this disturbing incident in the near future.